This last autumn, I received a surprise package from my dear friend, Noriko. When I opened it, my breath was taken away by a gorgeous portrait of my dog, Hawk. Our family of golden retrievers are fairly long lived. We routinely see them age 14-16 years, so we were stunned when Hawk suddenly died in June of 2012 at the young age of 6. 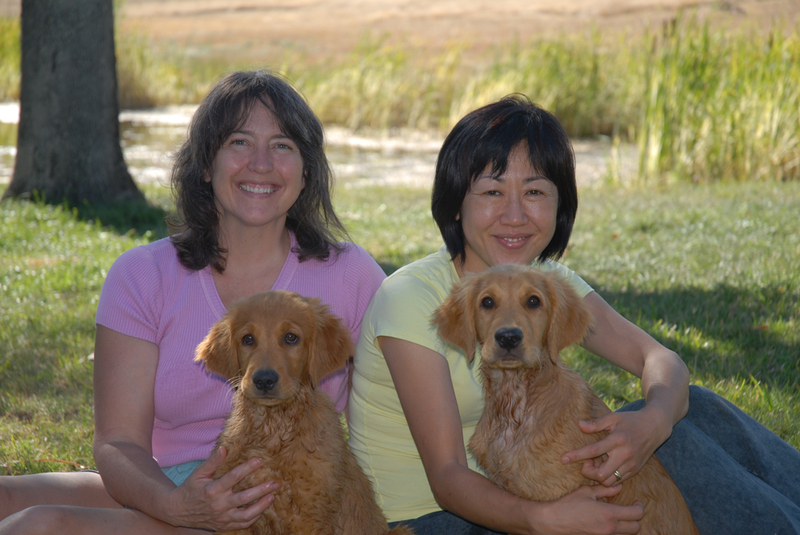 Hawk was littermate to Noriko’s Sakurako. Saku, lived with us for 11 months before she was able to go home to Japan. Prior to and while Saku was growing up at our home, we were blessed with the friendship of Noriko and Yoshinori. This friendship has continued over the years. We had an inkling that Noriko was artistically talented, but in her modesty, she did not let on. When I see the way she captured the spirit of Hawk, it is as if a part of Noriko’s beauty and grace reflects back in her creation. I see her in every stroke. This beautiful gift is on display at my art table as a reminder of the gift of friendship spanning miles and time. Simply bliss. RedTail’s Wind Walker “Hawk” – by Noriko Akiyama, posted with permission. 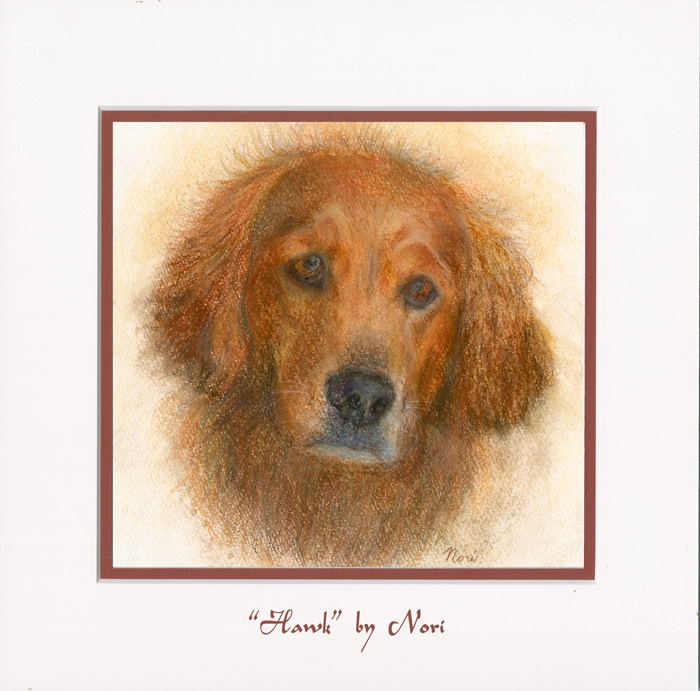 This entry was posted in Art, Bliss Tips, Pets and tagged friendship, golden retriever, Noriko Aikiyama, pastel, puppy by MaryALivingston. Bookmark the permalink. What a lovely friendship, wonderful story, and a most beautiful portrait of Hawk. Mary.Thank you so much for your gorgeous comment for my drawing in your blog. I can hardly express my feeling in English aftet reading it. And l am very happy to have met you &Tim in this earth. You gave us much happieness through Sakurako. You always assist us to get gorgeous, beautiful, and smart goldens which are our treasure in our life. 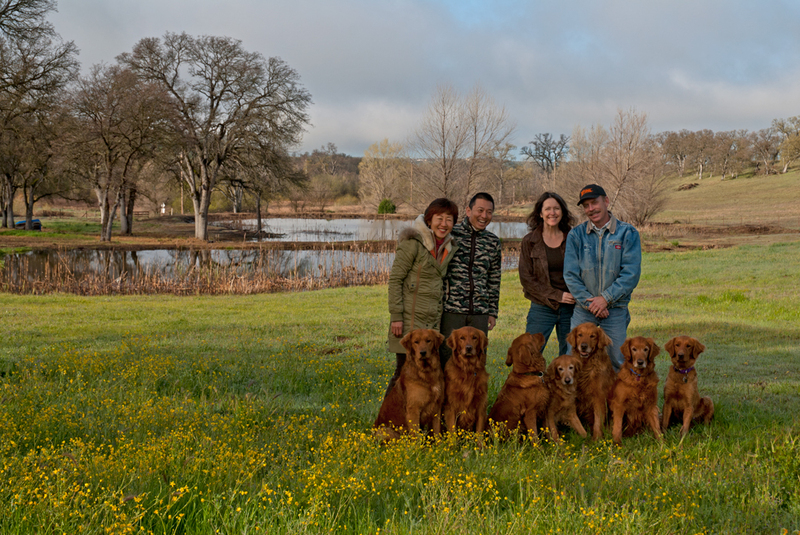 The technique for training dogs as gundogs which you taught us help us a lot and our friends. . Thank you (^_^)/Mary & Tim and God for our friendship! – You are too kind, Noriko. I have enjoyed seeing your pet portraits, you are so talented and accomplished. I wish for the world to appreciate your beautiful art and know the kindness of your heart. I must also blog about the life of bliss your goldens get to enjoy. I think a lot of people do not know retrievers get to work as gundogs in Japan. 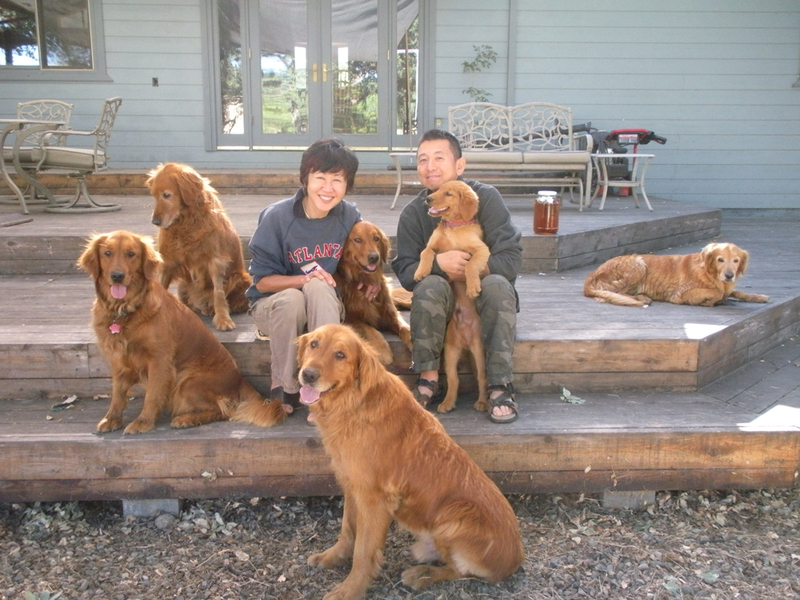 Sakurako, Jutaro, and Miniko are very fortunate retrievers to have you. What a nice story! Thanks for sharing! Wonderful story Mary and what a great gift to receive from Noriko that you will treasure forever. Brought a tear to my eye again as I still miss that boy and feel very fortunate that I have little Bella who looks just like her daddy. Nice photographs of all of you! Interesting note, they were married in 1983 and so were we, life is a curious thing! Such a special gift and a lovely story too. A treasure of a portrait! Beautiful story, wonderful portrait, and great photos! Hawk’s portrait is stunning, and the “full family” pictures are wonderful. Great looking dogs. Sorry that Hawk died so young. The portrait is a wonderful reminder. Thanks Jeanne. Noriko’s portrait of him is indeed beautiful. Loved the story and photos. Nice to see familiar Gravitas in the comments, the world is shrinking we can all be friends and communicate. Indeed it is. I found your blog, JacksJottings through Zeebra Designs Timeout for Art. 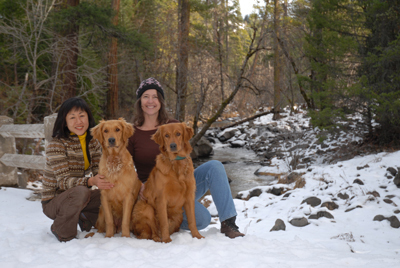 Two things in common: goldens, my favourite pick if ever I get a dog, and a long-time friendship with two Japanese girls who stayed with me at different times 25+ years ago – and still in touch today! A lovely post. I was very touched by it. It is amazing how we make connections and friendships. What a fabulous portrait and super photos! Thanks for the kind comments and the blog mention! I like your dogs. I like the background too. What a beautiful place to live. No mink vest, perhaps a minkini.